When Robin suggests the rehearsal dinner be in Canada, her friends have some fun at her expense. 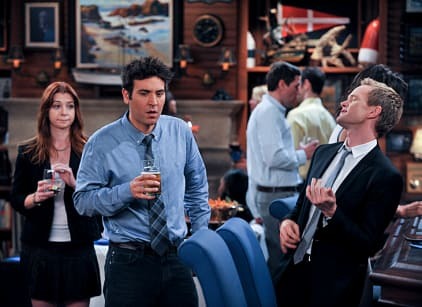 Barney suggests they have the rehearsal dinner be a laser tag party. Ted offers to play the piano, but is only allowed to when he promises to dress like Liberace. during a flash back we see how Barney got Robin back for his surprise bachelor party. After he jokes about calling off the wedding, Robin makes Barney promise,no more surprises. As the actual rehearsal dinner approaches, Barney says he is sure Robin is planning a surprise laser tag rehearsal dinner. He and Ted tease Lily about her inability to keep a secret. When she comes clean about Marshall taking the new job without talking to her first, Robin makes time for her friend. Shortly after she is called away by a disturbing call. Robin finds Barney handcuffed in the security office of a laser tag place. It turns out to be a surprise rehearsal dinner in her honor as Barney bring Canada to Robin.